Cognitive Load Theory (CLT) is an information processing theory used to explain the limits of working memory based on current knowledge of human cognitive architecture. Cognitive architecture refers to the concept of our minds having structures such as working memory, long term memory, and schemas. 1. Magic Number 7: Working Memory can only handle 7 disconnected items at once. 2. Overload occurs when Working Memory has to process too much too fast. 3. Long Term Memory is virtually unlimited and assists Working Memory. 4. Schemas are memory structures written in Long Term Memory by Working Memory. 5. Working Memory is overloaded when its ability to build a schema is compromised. 6. 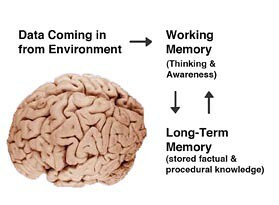 If Working Memory has capacity left over, it can access information from long term memory in powerful ways. 7. Automation (doing something without conscious thought) results from well developed Schemas due to Working Memory's interaction with Long Term Memory. Well developed schemas come with repeated effort and effective practice. WARNING! the "zero sum game"
Extraneous load is caused by inappropriate instructional designs that force working memory to focus away from building schemas into long term memory. Intrinsic load is caused by the irreducible complexity of elements interacting in working memory. Germane load is caused by effortful learning resulting in Schema construction and the process of automation. Working memory can operate more efficiently when information is presented to the learner in meaningful chunks. Instructional designers can sort of imitate schema development and even substitute for missing schemas by developing instructional materials that use this chunking idea. For processing inside the brain, advanced organizers can be used to trigger long term memory. For receiving data from outside the brain, graphic organizers, job aids and mneumonic devices can be used to chunk information into smaller groupings. For complex tasks, procedures need to be isolated and rehearsed multiple times for working memory to process and automation to develop. If the instructional designer cannot address the novice's POV, then more repetition will inevitably be required for instruction to be effective. Fight the Split Attention Effect: Design presentations so slides are more visual instead of text heavy. That way the audience can process information more naturally instead of having to simultaneously read lots of screen text in addition to listening to the presenter's narration. Splitting attention too much puts stress on cognitive load. Split attention also occurs because the student is forced to scan for textual information that is separated from the illustration or graphic. Provide meaningful information contexts or landscapes. Find out how information can be beautiful at: TED Talks: David McCandless: The beauty of data visualization. See if you can identify how his presentation design addresses the needs of the human mind. You might even see some examples that go against CLT principles as well. 2. Miller, G. A. (1956). The magical number seven, plus or minus two: Some limits on our capacity for processing information. Psychological Review. 63, 81-97. 3. Reynolds, G. (2008). Presentation zen: Simple ideas on presentation design and delivery. Berkeley: New Riders. 4. Sweller, J. (2005) Implications of cognitive load theory for multimedia learning. In R.E. Mayer (Ed. ), The Cambridge handbook of multimedia learning (pp. 19-30). Cambridge: Cambridge University Press.